I’ve been working on a project in the shop recently. There’s a type of bike that I really like that I wanted to build a few of. It’s an off road touring bike, a “gravel bike,” or, in this case a so-called 29er touring bike. There are many different ways to build this bike. I’ve chosen to build them with 29 inch wheels because of the comfort on bumpy terrain, no suspension needed. Also for tire selection – there’s a wide range of fatter tires that come with or without tread for on and off road use. 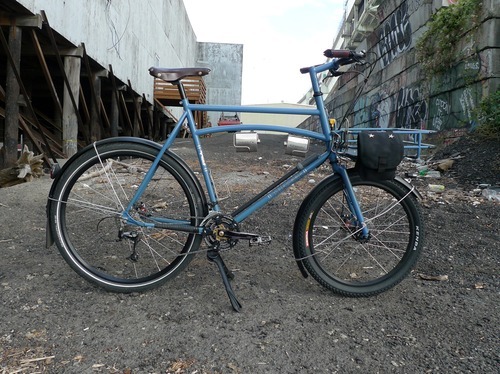 I want this bike to be a solid touring rig that can take the trails, forest service roads and whatever else you may come across on your travels. I want it to be able to stably and securely carry all your camping gear. And I want it to be comfortable for long days in the saddle, whether you’re on the road, or off of it. This would also make for an excellent year-round commuter, able to take all road conditions and all weather types.